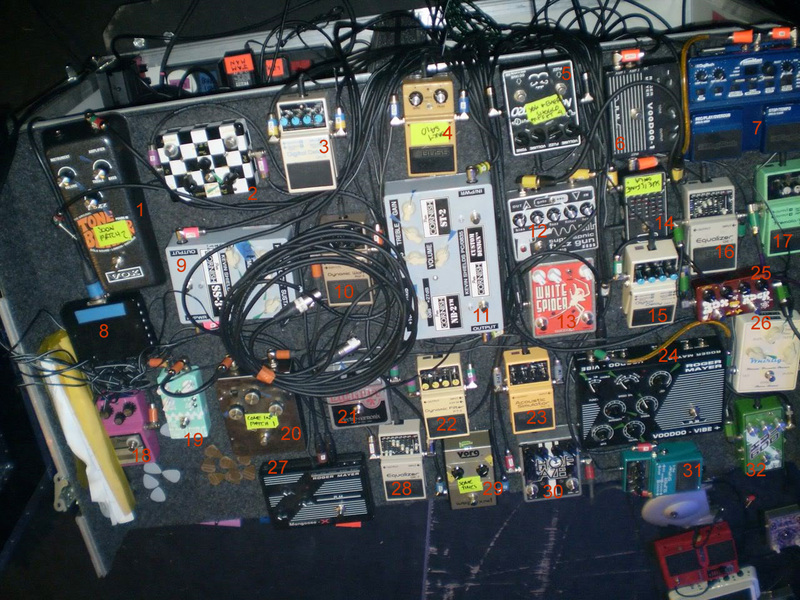 In the bottom left corner of Jamie Cook's pedalboard, his Death By Audio Supersonic Fuzz Gun Pedal can be seen. [*Music Radar*](http://www.musicradar.com/news/guitars/u2-exclusive-the-edges-stage-setup-revealed-223342/) talked with The Edge's guitar tech, Dallas Schoo about this pedal, to which Dallas replied "Oh, they're great! We're using the Supersonic Fuzz Gun and the [Harmonic Transformer](http://equipboard.com/items/death-by-audio-harmonic-transformer-pedal). This guy, Ben Curtis - great guy - he makes these different distortion pedals and he turned us on to them...The Fuzz Gun is on No Line On The Horizon, that big intro sound. It's on Ultra-Violet, too - it's fantastic. The guy is always looking for something new that can create music, and he'll tinker with a pedal or a device for days until he can make it do something he wants." Jim Matheos lists his gear on his website. > This is the most badass pedal I’ve ever owned. There’s a switch between gated and oscillated modes - when it’s gated it still sounds mental, but in oscillation… everything just kicks in. The moment you stop playing, you get these crazy wails and siren noises. It’s quite untameable, but I quite like that. Every night we use it, things sound a bit different because it’s impossible to control. In this "pedalboardish mess" photo, which was posted on his Instagram profile, one of the pedals that can be seen is the Death by Audio Supersonic Fuzz Gun. 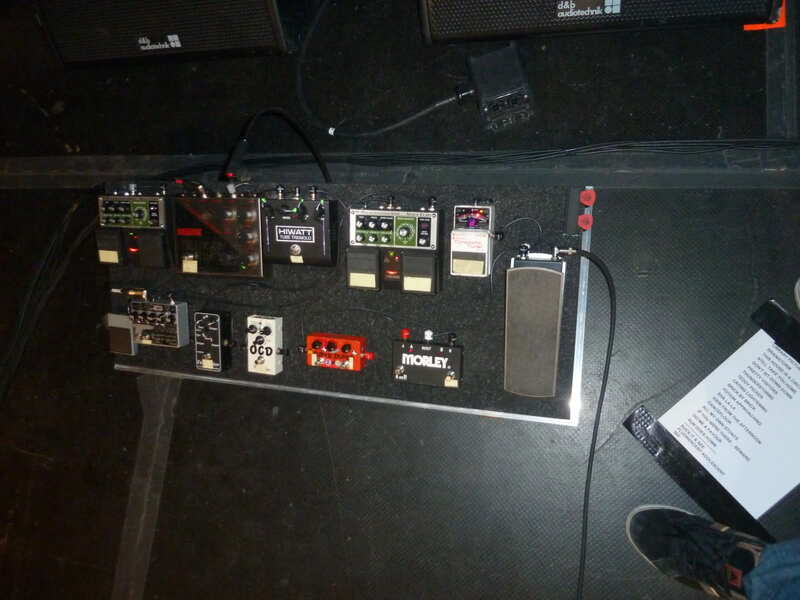 Among the many pedals used by Kevin in this image, the Death By Audio Supersonic Fuzz Gun Pedal can be spotted. This website contains an excerpt from an [interview](http://u2-stage-and-studio.com/edge/id83.html) with [U2's](http://equipboard.com/band/u2) [the Edge](http://equipboard.com/pros/the-edge), who credits Ben with having introduced him to this pedal. 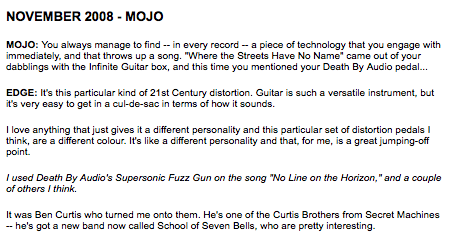 "I used Death By Audio's Supersonic Fuzz Gun on the song 'No Line on the Horizon,' and a couple of others I think. It was Ben Curtis who turned me onto them. He's one of the Curtis Brothers from Secret Machines -- he's got a new band now called School of Seven Bells, who are pretty interesting." To the left of the colourful pedals is the Fuzz Gun by Death by Audio. "I also play around with some pedals. One of my favorites that I used on the record is a Death By Audio pedal called the Supersonic Fuzz Gun. It's so messed up and dirty sounding. I love it." A really interesting pedal that we have mostly used on synths and drummachines. Oliver made this pedal for everyone who loves that nasty sound of the early Jesus and Mary Chain records. Try before you buy, cause this monster isn't for everyone. It will drone, buzz, fizz, fuzz and velcro. Pricey, but unique. Most people go SSFG or Fuzz Factory (if you want crazy fuzz). Weirdest pedal I own, by far. Got one of these because I heard Edge from U2 uses one... I know you should never just model your pedal setup after your heroes. I like the pedal a lot, it's... neat. It's supposed to be an experimental fuzz but I think of it more as just a plain old boutique distortion. I actually think it's more useful for synths and drum machines. The fuzz on this thing has a weird, robotic squelch after a note is played (which is on purpose). Has pretty limited use.